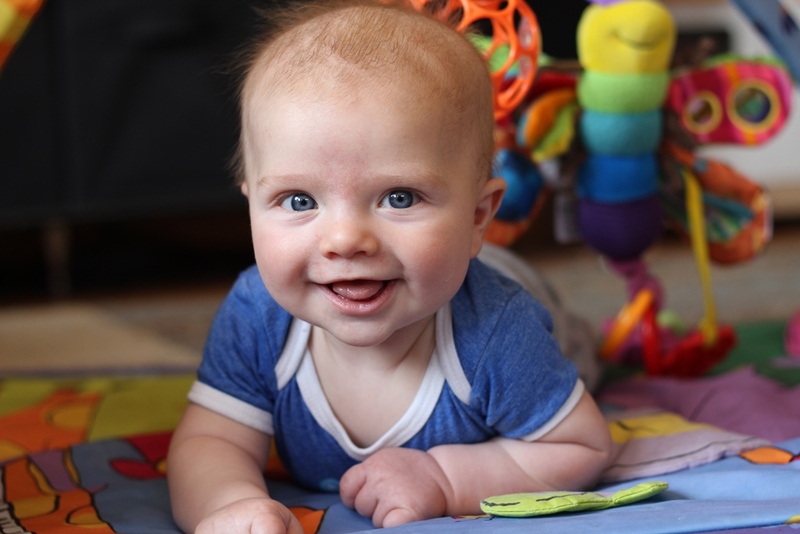 Full disclaimer – I rarely make my kiddos do tummy time. I just can’t make them sit there and cry because you’re supposed to do “x” minutes of it every day. I baby wear my kids a lot, and that is a great way to help them work on neck strength without subjecting them to the dreaded tummy time. At any rate, every once in awhile I do stick them on their bellies to see how strong they’re getting, and Harv totally rocked it yesterday! Here are two comparison pics of Stella & Harvey at almost the exact same age. So freaking cute!! Love his tongue sticking out a bit. I didnt force tummy time either, it was torture for my two. Funny! My kids were the same, but opposite. Matthew could do it great, and Bryson never really did much. Conversely though, Bryson was the roller and Matthew wasn’t. I never enforced tummy time either. Both kids have been in the jumper since 2 months, and I wore B a LOT, so I figured no need. Totally rationalizing, I know! Great pic of Harv! I think they’re starting to look less alike, but still very similar! Those little loves of yours are twins! Poppy wore those duck jammies last night! I have adored them on all three girls. Harvey looks is old! Probably because he’s rocking at tummy time. I think he looks like an exact match of you and Charlie here – beautiful. Adorable! And wow, so strong little Harv!!! I love that blue top/onesie on him. He looks ready to take on the world! Gorgeous! By the way, I have the exact same mat! Go Harvey! We are horrible with tummy time. Mostly because L seems to nap a lot and naps when we have time to sit with him and is awake when we don’t. I didn’t know about the “x number of minutes” thing. We have always done it until they are clearly upset. Sometimes that is .5 seconds and sometimes that is 5 minutes. Both boys have had good neck/head control from the start and we hold them a lot. 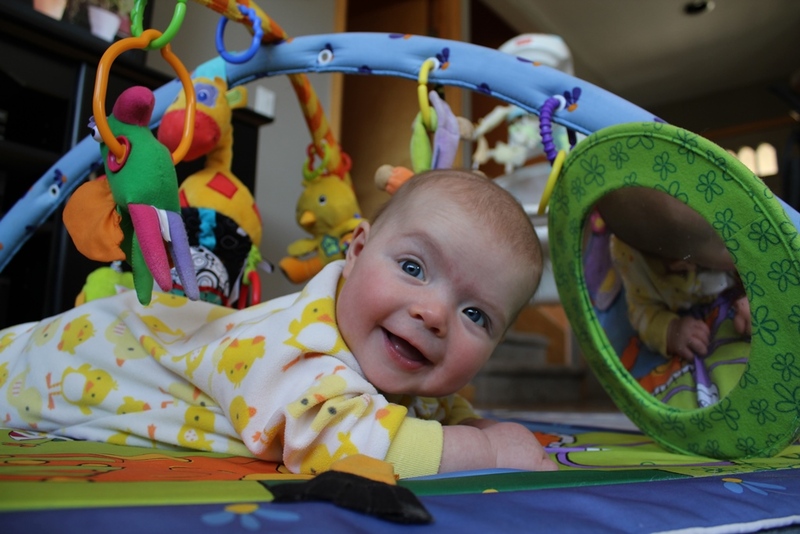 I know it’s also about strength, but for me the tummy time is more about the flat head issue. They look so alike. I can make out Stella and Harvey from just looking at them, but they do look alike. ← What Kind of Parent am I? 2nd ed.